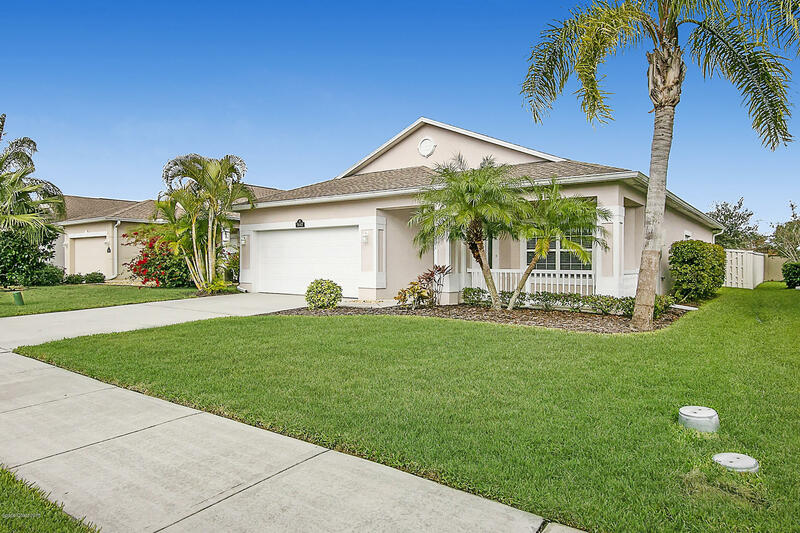 5647 Indigo Crossing Drive, Rockledge, FL.| MLS# 836631 | Free Brevard County MLS Home Search. No Agent Needed. Daily Auto-Email Listings of All Brevard County Homes and Listings For Sale That Meets Your Home Buying Criteria. Brevard County Real Estate Market Information. Move in ready three-bedroom, two-bathroom contemporary home in sought after Indigo Crossing. This versatile split floor plan is centered around a comfortably spacious living/dining room with both an adjacent flex space & separate family room. Beautiful laminate flooring throughout! Nest thermostat. The impressively-sized kitchen has ample cabinet & counter space and brand new stainless appliances! The master en suite has a recently renovated low-step shower, double sinks, & a walk-in closet. The delightful fenced back yard has plenty of room for a pool, a swing set, or a gathering of friends & family. The screened trussed porch lets you rest in the shade while others play! This desirable neighborhood is has a community swimming pool & is within walking distance to Manatee Elementary!